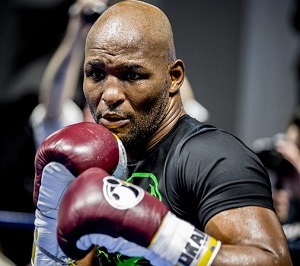 A new list of old boxers ranks Muslim American multi-division champion Bernard Hopkins the second-best fighter over 40 years old in the sport’s long history. Hopkins could debatably be number one on this list, due to his impressive run as an elder statesman. Despite the enormous success Hopkins has found in boxing, his career started rather inauspiciously. During a prison sentence that lasted almost five years, the young Hopkins learned to box. After being released in 1988, he lost his first fight to one Clinton Mitchell. After a little over a year off, Hopkins was back in the ring and this time he was winning and he wouldn’t lose for twenty-two straight fights. In his first title bout Hopkins lost to Roy Jones Jr. by a wide decision. However, following the Jones fight, B-Hop wouldn’t lose another fight for twelve years, until July of 2005 when he was forty years old. Jermain Taylor ended Hopkins streak and handed him yet another defeat in December of 2005. Consequently, it seemed as if Hopkins career may be coming to an end. What no one knew is that Hopkins would emerge from the ashes like a phoenix. After the second Taylor defeat, Hopkins moved up two divisions, from middleweight to light heavyweight, and faced Antonio Tarver. Hopkins was forty-one and facing the man named by Ring Magazine as the light heavyweight champion. The Alien proved to be far too much for Tarver to handle and won by a very wide decision. Hopkins then beat master boxer Winky Wright by unanimous decision and received the wrong end of the nod, in a razor close fight with Joe Calzaghe. After losing the title to Calzaghe, Hopkins schooled the man who conquered Jermain Taylor, Kelly Pavlik. Furthermore, in 2011 at the age of forty-six Hopkins became the oldest man to win a title, when he beat Jean Pascal for the WBC light heavyweight crown. Hopkins surrendered the crown to Chad Dawson only one year later and it seemed like he might be done. But The Alien wished to prove just how unnatural he was and won the IBF title after outboxing Tavoris Cloud. Two fights later Hopkins added the WBA title to his résumé. In this match, he set the record for becoming the oldest fighter to unify titles, when he defeated Beibut Shumenov at the age of forty-nine. Following the Shumenov fight, Hopkins agreed to fight the Russian destroyer, Sergey Kovalev. Sadly, Kovalev was too much of a match for B-Hop and the old champion did all he could, but nevertheless lost a wide decision. Hopkins will certainly wind up in the Hall of Fame and there’s little out there left for him to accomplish. Yet, he is reportedly entertaining the idea of having one more fight. Hopkins, who has been trained by Muslim American trainer Naazim Richardson since 2005, has a career record of 55-7-2, with 32 knockouts and two no-contests. His 20 middleweight championship defenses are a division record, and he has broken his own record multiple times as the oldest fighter to win a world title. Whenever he decides to officially retire, Hopkins is a no-brainer pick for the International Boxing Hall of Fame.